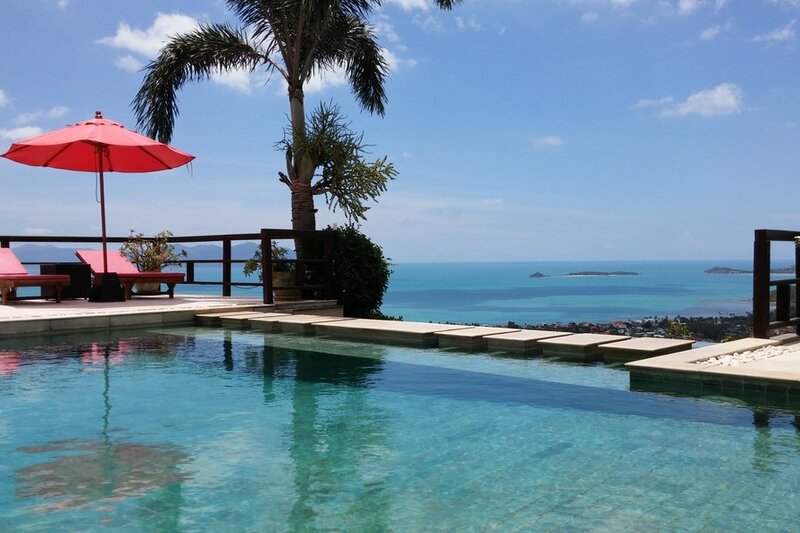 Beautiful, secluded, staffed villa at the top of Bophut Hill with incredible sea views. Large sun terrace, pool, gym, sauna. 2.5km from the restaurants, bars and beach of Fishermans Village. Bophut Talay is a beautiful villa nestling in the peace and quiet of Bophut hills with spectacular views of both Bophut Bay and Big Buddha Beach. This luxurious four bedroom villa has been tastefully decorated throughout with furnishings and fittings as impressive as the stunning views. The villa, enclosed by a local stone wall with attractive recessed stone carvings, is accessed through a private entrance. The lower ground floor has off road parking. From the ground floor, stone steps lead up to a covered walkway with a small seating area and stone steps lead across a water feature to the large sun terrace, infinity pool, comfortable sun loungers and a covered sofa sala. To the right of the walkway a door opens onto the master bedroom that has digital mood lighting, a hard wooden floor and king-size bed makes this room ideal for relaxing as well as sleeping. The en-suite bathroom has double sinks, a large bath, an outdoor water feature and open top rain shower as well as a generous size walk-in wardrobe and dressing area. The bedroom’s double sliding doors open up onto the pool terrace where you will find his and hers sun loungers. To the left of the walkway, two large, hard wood carved doors open up onto the extensive lounge and dining area. Take a left and you will come to the second bedroom known as ‘the orange room’. Tasteful orange and sunset red paintings adorn the walls and match the scatter cushions king-size bed. The room has a comfortable sofa as well as ample wardrobe space. The natural stone bathroom has a bath as well as a rain shower. Moving back into the living space with doors that open directly onto the pool you will find a comfortable seating area on the right with slatted window blinds, wooden beamed ceiling and attractive hard wood shelves that house some interesting artifacts that include an impressive white stone Buddha statue. Just off the dining area is a separate and well equipped western style kitchen with granite work surfaces, a large stand alone American style fridge and built in cooker, dishwasher, as well as a three ring gas hob. Another door from the dining area leads onto bedroom three. This has a king-size bed, sofa and is beautifully decorated with orange and burgundy tones. Bedroom four is to be found beyond the dining area and has direct access onto the sun terrace. The en suite bathroom has a steam shower for the ultimate bath time experience. Taking the steps down from the terrace will take you to a well appointed fitness room, shower room and sauna. Bophut Talay , though on the hillside is located on a flat plot therefore most of the villa is on one level making it a safe holiday environment for children and elderly guests alike. The villa is five minutes from famous Fisherman's village and newly opened 'The Wharf' with its numerous bars ,local and world class international restaurants. Santiburi championship golf course is within ten minutes as are all the best beaches and Airport. The villa is staffed during the day to ensure guests are well looked after and a daily complimentary continental breakfast is included.Bedrooms are en suite and have a safe for personal belongings.